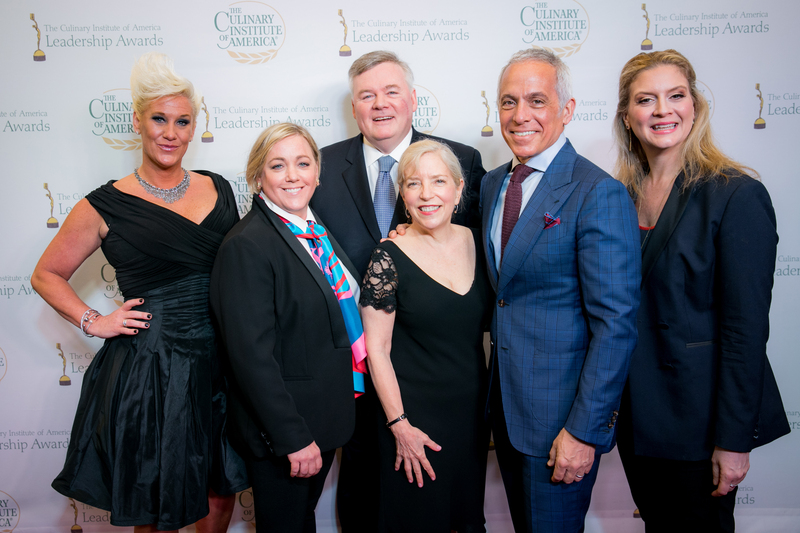 Hyde Park, NY – Five CIA graduates who are “Stars of the Small Screen” were honored by The Culinary Institute of America at the college’s Augie Award™ ceremony at the Ziegfeld Ballroom in New York City on April 25. The Augies—the college’s Leadership Awards event—is the CIA’s largest annual fundraising program. Through sponsorships, donations, ticket sales, and an online auction, this year’s gala raised more than $1 million, with proceeds benefiting student scholarships at the college. The 2018 Augie Award recipients are Anne Burrell, Julia Collin Davison, Amanda Freitag, Sara Moulton, and Geoffrey Zakarian. Hundreds of foodservice and hospitality industry leaders, celebrity chefs, and other luminaries from business and entertainment joined to honor these alumni who have helped raise the status of the food and hospitality industry through their work on popular television cooking shows. Created in tribute to famed French chef Auguste Escoffier in recognition of his unwavering pursuit of excellence, creativity, and professionalism, the Augie Awards were created by the CIA in 2007 to honor members of the food and foodservice business who exemplify those traits. Thirty current CIA students were on hand to assist guest chefs—including CIA graduates Lauren DeSteno, Christina Marcelli, Kwame Onwuachi, Maureen Petrosky, Foluso Salami, and Sahara Uy—who prepared hors d’oeuvre for the opening reception. The students also took time to thank the evening’s attendees for supporting CIA scholarships, as 91 percent of the CIA student body depends on some type of financial aid. The CIA Leadership Awards are made possible, in part, by the generous support of gold sponsors Ecolab and MillerCoors, silver sponsors Breakthru Beverage Group, Chipotle Mexican Grill, and Colavita, and dozens of other suppliers to the food and hospitality industries, plus many individual friends of the CIA.